This breakthrough new book may help save countless lives and avoid enormous losses. It presents a methodology for using gas migration to predict earthquakes and explosive gas buildup. 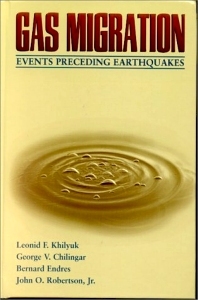 Using rigorous scientific investigation and documented worldwide case histories, this remarkable book presents compelling evidence showing that changes in gas rates, composition, and migration accompany the tectronic events preceding earthquakes and their associated seismic events, such as volcanoes and tsunamis. Because these gas parameters are detectable and measurable, they provide an early warning of seismic activity. Leonid F. Khilyuk, Ph.D., is a consultant in mathematical modeling of environmental processes at the University of Southern California, former Chairman of the Department of Computer Sciences and Applied Mathematics in the Kiev Technological University. He has over 100 publications worldwide in Mathematical Modeling of Environmental Processes, Control Theory, Probability and Statistics. John O. Robertson Jr, Ph.D., P.E., has over 30 years experience in the area of petroleum and environmental engineering. He has co-authored over 9 books and 20 articles in leading scientific journals. He has been awarded three gold medals and many international honors for his work. He has served as president of Earth Engineering, Inc., for the past 20 years. Bernard Endres, Ph.D., is an environmental consultant specializing in the fields of oil and gas migration, geological site characterization and evaluation of chemicals and gas constituents relating to source identification within the earth’s geological structure. His scientific publications have included the environmental hazards associated with oil and gas migration.